The St. Louis Cardinals welcome the San Diego Padres to Busch Stadium on Friday. The probable starters are Andrew Cashner for the Padres and Michael Wacha for the Cardinals. The opening line for this matchup has San Diego at +164 and St. Louis at -174. The over/under was set at 6.5. The Padres, with a 38-42 run line record, cover the spread 48% of the time. They also have a 47-30 over/under record. 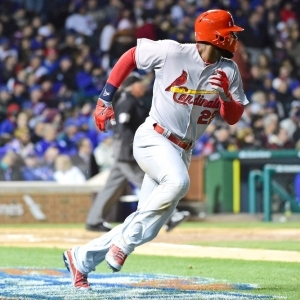 The Cardinals are 43-34 against the run line and have a 28-46 over/under record. They cover the spread 56% of the time. The Padres head into this matchup with a 37-43 record, including 19-21 on the road. Andrew Cashner has an earned run average of 4.22 and is 3-9 so far on the season while having a 1.42 WHIP. In his starts, the Padres are 5-11 over his 96 innings pitched this season while giving up 107 hits during those innings. Their record against the over/under when he starts is 10-5. He is getting 3.2 runs from the team when he takes the mound. The bullpen has an earned run average of 3.94 and they have given up 225 base hits on the year. The bullpen has struck out 223 and walked 88 batters this season while opposing teams hit .241 against them. San Diego has a team average of 8.87 hits allowed per game and are averaging 8.44 strikeouts per nine innings. With a team earned run average of 4.10, they are 24th in the league. As a team, San Diego is batting .240, good for 28th in the league while putting together a .243 average away from home. The Padres hold a .372 team slugging percentage and an on-base percentage of .295 which is good for 27th in baseball. With 77 hits, Justin Upton leads the team while his team ranks 23rd in hits per game with 8.24. With a 29-9 home record, St. Louis will hope to improve on their 51-26 overall mark. Michael Wacha is starting this game 10-3 for the season with an earned run average of 2.77 and a WHIP of 1.10. In his starts, the Cardinals are 12-3 and he has allowed 82 hits over 94.1 innings pitched this season. Their record against the over/under when he starts is 7-7. He is getting 5.2 runs from the team when he takes the mound. The bullpen has an earned run average of 2.15 and they have given up 199 base hits on the year. The Cardinals bullpen has struck out 205 batters and walked 72 this season while opposing teams have hit .237 against them. St. Louis has a team average of 8.19 hits per game and are averaging 8.09 strikeouts per nine innings. With a team earned run average of 2.64, they are 1st in the league. As a team, they are batting .263, good for 6th in the league while putting together a .273 average at Safeco Field. The Cardinals hold a .401 team slugging percentage and an on-base percentage of .327 which is good for 5th in baseball. With 84 hits, Jhonny Peralta leads the team while his team ranks 9th in hits per game with 8.94. San Diego has a team fielding percentage of .983 after having committed 50 errors with 772 assists and 2,155 put outs for the season. Over the course of this season, the Cardinals have accumlated 44 errors while having 755 assists and 2,087 put outs leading to a .985 fielding percentage.